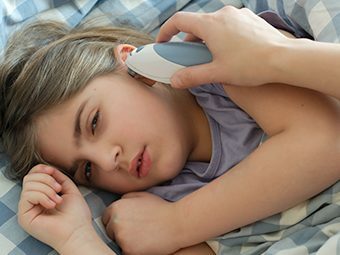 What Are Fever Blisters In Children? Isn’t it disturbing to see Fever blisters / cold sores in children around his mouth? 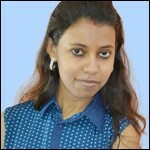 And, the concern is even more so, when the doctor diagnoses the rashes as fever blisters. 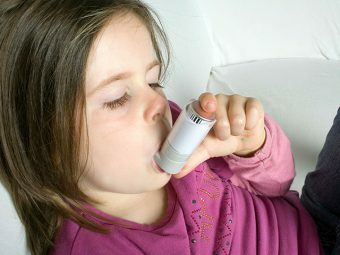 But, before you panic, here is some information on fever blisters in mouth and tongue in children and what you can do about it. So, read on and put your worries to bed! 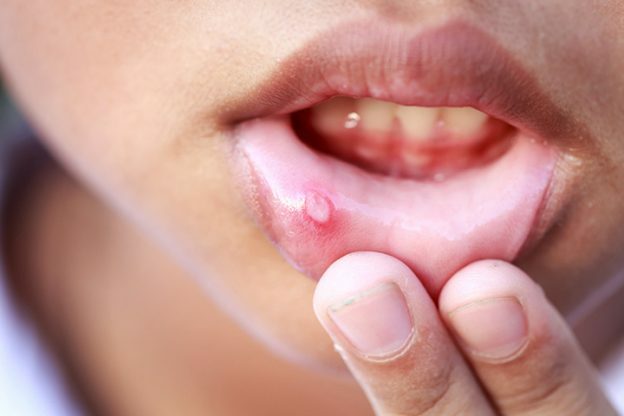 Fever blisters or cold sores appear in your child’s mouth and around the tongue. They usually appear when your child suffers from a fever due to the herpes simplex type 1 virus. The painful blisters usually heal within two to three weeks. In some cases, the blisters become swollen, painful and lead to burning and tingling sensations (1). The contagious virus HSV-1 easily spreads from an infected person to your child through kissing, skin contact or drinking water from the same glass or bottle. You should restrict your child from sharing her eating utensils, or other personal items like towels or handkerchief, as the infection spreads rapidly. The virus remains dormant unless some external triggers like intense sunlight, mental stress or an injury to the affected area activate it. After the contagious virus enters your child’s body, it remains dormant in her nerves of the face. It typically becomes active when your child contracts a cold or a fever. Mental stress often leads to an outbreak of fever blisters in your child’s mouth. Such stress can include both emotional as well as psychological trauma like depression, anxiety, anger or sadness or frustration (2). Severe pain, itching, burning and tingling sensation occurs around the infected mouth region. The cluster slowly erupts and breaks down rapidly. After a few days, they appear dried, crusted or scabbed. In oral sores, most of the blisters develop on the lips, inside the cheeks, throat, on the gums, in front of the tongue and on the roof of the mouth. The painful oral blisters make it difficult for your afflicted child to eat and drink her food. The blisters slowly extend down to your child’s chin and neck region. 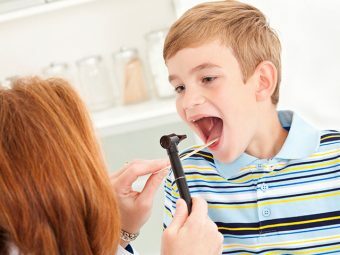 The doctor performs the initial diagnosis based on the physical examination and the characteristic appearance of herpes in your child’s mouth and tongue region. All these effective cold sore treatment for children options eliminate the sensation of severe pain and irritation (5). When your child’s age lies below six weeks, notify the doctor as soon as you notice the oral sores. Severe infection and complications mostly occur in infants and besides affecting the mouth, the harmful virus damages the brain health. Make your child apply a sunblock or lip balm on her lips before going out in sunlight. Wash your child’s daily use items like towels and linens in lukewarm soapy water. Restrict your child from sharing utensils, water bottles or other personal-use items. Restrict your little one from eating spicy foods, citrus fruits, and acidic vegetables. Make your child use a soft-bristled brush and develop the practice of flossing daily. Regular flossing helps your child get rid of the harmful germs (6). Whole milk contains a high proportion of calcium and immunoglobulin, which helps your child fight against the herpes virus. The typical fat present in whole milk, monocaprin possess effective antiviral properties, to accelerate the healing process. Soak a clean cotton ball in a solution of cold whole milk and apply it to your child’s affected mouth region. Leave it for the next ten minutes. The cold milk soothes the pain and the tingling sensation. Alternatively, make your little one drink warm whole milk mixed with one teaspoon of turmeric twice a day. A cold compress helps in alleviating your child’s pain and reduces the swelling and redness that commonly develops with oral blisters. Wrap few small pieces of ice cubes in a clean washcloth and hold it over the affected mouth region for 10-15 minutes. The cold compress makes your child’s lips tender and soft, and she can easily overcome the symptoms of dehydration associated with mouth blisters. The key ingredient in licorice, Glycyrrhizin, possesses effective anti-inflammatory and antiviral properties. Hence, the herb serves as an excellent remedy for fever blisters. Applying the herb reduces the redness and swelling and further speeds up the healing process. You can make a thick paste of licorice root powder and dilute it with water. Dab the paste with a cotton ball around your child’s affected mouth region. You can repeat the application for twice or thrice a day until the blisters disappear completely. Alternatively, you can make your child drink licorice root tea or choose from herbal supplements available in the market. Did you child suffer from oral blisters? 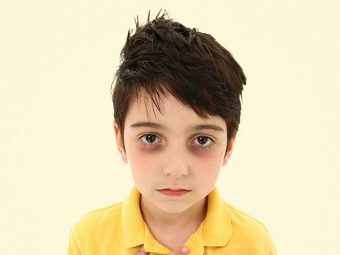 What curative measures did you adopt for your child’s quick recovery? Tell us here!